Saying grace gets Sister Bear wondering. “What’s God?” she asks Mama Bear. Mama Bear tries to answer, but each answer leads to another question. Just then, Gramps and Gran walk by, on their way to services at the chapel in the wood, so the whole Bear family decides to go along. While at services, Brother and Sister Bear have to sit still for a long time, but as their neighbors and family take turns expressing gratitude, they begin to understand. And though Sister Bear still has a question, Papa Bear has an answer ready. 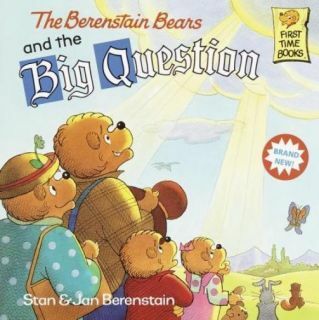 Literary legends Stan and Jan Berenstain’s First Time Books address many of the issues of childhood in simple, direct ways, opening the door for discussion and leaving room for parents to personalize each situation.